Meet our November Featured Creature Couple, beautiful birds Tomas and Henrietta! 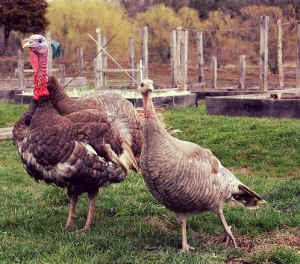 The bonded turkeys came from a meat farm but the efforts of a concerned neighbor spared them from slaughter. They arrived at CAS last winter and quickly joined our free-ranging, underfoot family. Tomas enjoys strutting around with his gorgeous feathers on full display, gobbling at all visitors, staff and fellow critters. Sweet Henrietta is shyer, perusing the tall grasses on the hillside for a tasty treat or a cozy nesting place. Tomas always keeps a watchful eye on her whereabouts and the two can be heard clucking to each other whenever one is out of sight. Lately, however, Tomas has been showing off, swaggering around the recently rescued turkeys from Staten Island. He is obviously enjoying the attention of the new females, but Henrietta is not amused. 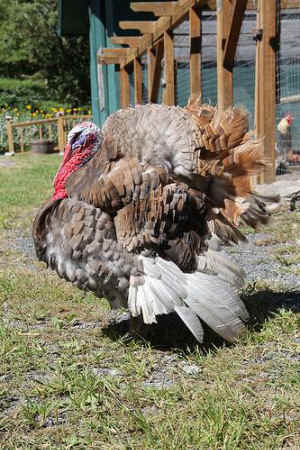 Staff has seen Henrietta physically pull and push Tomas away from the Staten Island flock [28 lives saved as Staten Island Turkeys move Upstate]. These lovebirds are beginning to spin a soap opera tale! To sponsor these feathered friends, please email Michelle Alvarez at [email protected]. Tomas and Henrietta are also available for adoption together; please contact Erin Murphy at [email protected] or call (845) 336-8447×232.